The United States Agency for International Development (USAID) recently awarded Nathan Associates the five-year Public Indefinite Delivery/Indefinite Quantity (IDIQ) Public Financial Management II contract valued at $475 million. This IDIQ assists developing countries along the path of self-reliance and resilience through the strengthening of PFM systems and better macroeconomic, trade and investment policies. The contract supports effective governance through the provision of assistance to national and sub-national governments to collect and manage public funds in an effective, transparent and accountable manner, and the adoption of policies that reduce poverty and promote inclusive economic growth. The new IDIQ will build on the achievements of the predecessor IDIQ. Under PFM, Nathan successfully implemented a range of USAID programs including the global Leadership in Financial Public Management (LPFM) Project that included 36 activities in 26 countries; the U.S.-Asia Pacific Economic Cooperation (APEC) Technical Assistance to Advance Regional Integration (U.S.-ATAARI) project; Lao PDR – U.S. International and ASEAN Integration (LUNA II) project to help integrate Laos into the world economy; and the Free Trade Implementation Project which assisted Colombia in meeting its commitments under the Colombia Trade Promotion Agreement..
“Nathan has been a long-term USAID partner in its effort to strengthen host countries’ capabilities to develop and implement sound economic policies,” said Sue Chodakewitz, Nathan’s President and CEO. “We are pleased to partner with USAID again, through the PFM II IDIQ, to further USAID’s goal of enabling host countries to be self-reliant through increased domestic resource mobilization, sound public financial management, prudent macroeconomic policies, enabling the environment for the private sector, and a robust external sector. 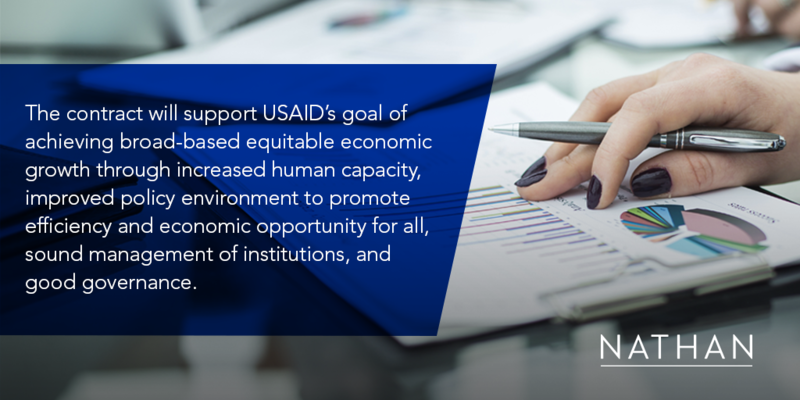 The Nathan consortium is dedicated to fostering inclusive economic development in all countries that we work in, and look forward to working with USAID on many important endeavors through the PFM II IDIQ contracting vehicle over the next five years,” she added. Known for both technical and service excellence, Nathan has corporate offices in the US, UK, and India and more than 25 program offices around the world. More information about Nathan can be found at nathaninc.com.